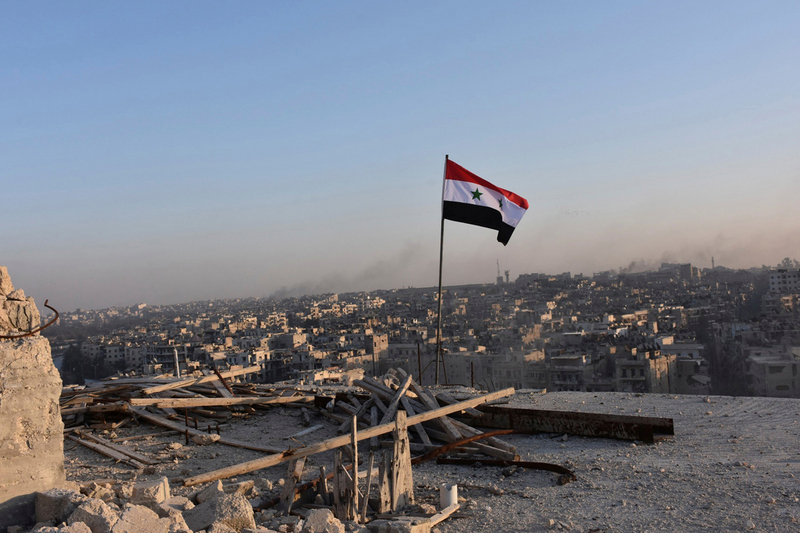 A Syrian national flag flutters near a general view of eastern Aleppo, Nov. 28, 2016. Russian military transport planes carrying medical equipment and personnel have left for Syria to provide assistance to Aleppo civilians, the Russian Defense Ministry said on Nov. 30. "The personnel of the Russian Defense Ministry’s special medical unit, a field hospital, special gear and medical equipment have left for Syria by plane," the Defense Ministry said. "Upon arrival Russian military medics will start providing medical assistance to civilians and refugees near Aleppo," the Defense Ministry said. The field hospital consists of an emergency room, an outpatient unit, a therapeutic department for children, a surgery department, an anesthesiology and intensive care department, an X-ray room, a medical laboratory and a special medical aid unit. Bearing in mind the specifics of the situation near Aleppo the mobile unit has been complemented by children’s doctors and obstetricians. The mobile hospital has a reserve of all required medicines in stock. According to Russian Defense Ministry spokesman Igor Konashenkov, more than 5,500 civilians, including 2,800 children have left the militants-held districts of Aleppo with assistance from the Russian center for reconciliation. All have been accommodated at special humanitarian centers, prepared for them by the Syrian authorities in advance. Russia and the local Syrian authorities are delivering food, essentials and medical supplies there.